Once again, like every year, time has come to celebrate Towel Day, a great occasion to ponder Life, the Universe and Everything. 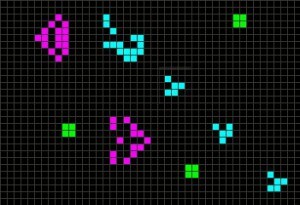 Speaking of Life — a surprising number of people, including software developers, don’t know about LIFE, also called Conway’s Game of Life; an even smaller number is aware of the corollaries, let alone accept them as a fact of life (pun intended!). So what is LIFE? A live cell with fewer than two live neighbors dies (think: dies of loneliness). A live cell with two or three live neighbors continues to live. A live cell with more than three live neighbors dies (think: dies of overpopulation). A dead cell with exactly three live neighbors becomes a live cell (think: birth of a cell). You start with an initial (e.g. random) set of live and dead cells, let time increase in discrete steps and after every step you apply these four rules. That’s all. After every step the board contains a new set of live and dead cells. It is quite fascinating to see how structures, patterns (or objects) emerge, move, disappear and reappear. Some of these objects have been given names that aptly describe their nature, like “pulsars”, “gliders”, “glider guns”, just to name a few. Isn’t this very much like our own universe? In our universe, we have some fundamental laws, which give rise to higher-level structures and laws, up to highest-level laws of physics or principles of human behavior. What Conway proved was that complex structures can emerge from simple rules; he proved that you don’t need a Creator to obtain a complex universe, just simple rules, time and favorable circumstances. Religious people often have a hard time accepting that. One the one hand, they argue, Conway didn’t prove the absence of a Creator, and second, Conway himself acted as a Creator himself since he — after all — created the rules of the game. Isn’t there, in our world, at least room for such a “Creator of Rules”? Nobody knows, but I personally don’t think so. What Conway did was not create the rules — he rather zoomed in on a particular universe with a particular rule set, chosen from an infinite set of rules: He just shed light on one particular universe that is favorable of life in an infinite multiverse.